The Helpful Home: Stainless Steel Cleaner--quick and easy! Welcome to The Helpful Home! We are all extremely busy...with family, kids, or just finding time for ourselves. I hope you will find easy recipes, organizational tips, and helpful hints to make your home life simpler...giving you more time to spend with the ones you love. 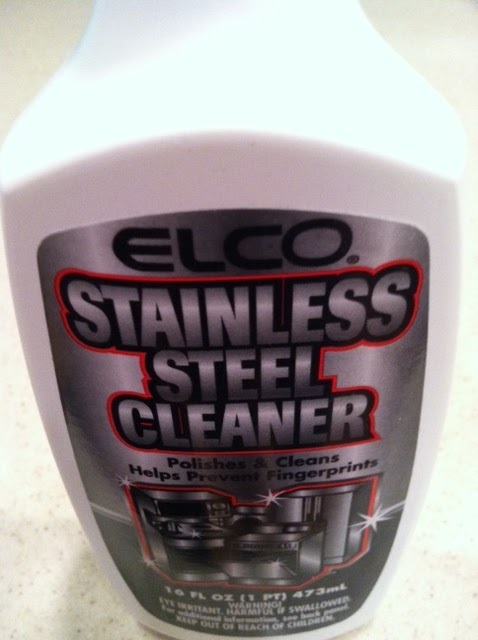 Stainless Steel Cleaner--quick and easy! I love stainless steel refrigerator and appliances--love the look, but hate the fingerprints and smudges that inevitably end up all over it. Well, I found a liquid cleaner that is super easy to apply, and takes those fingerprints and smudges away quickly! It's by ELCO. I got mine at Sears. I can't remember how much it cost, but it wasn't that much. Super easy to use--just put a little on a cloth (I use paper towels),wipe on...then get a dry cloth/towel and wipe off. Easy! It also removes dirt and grease, and helps prevent fingerprints. If you have stainless steel...this is a must-get! Wire wall rack--wish I had this in my closet! Garlic peas, Wasabi peas-a tasty snack! Tiger sports water bottle-best ever!! Manoa lettuce and Sweet Basil grows again! Dish drying mat--another great find! Get rid of coffee stains in your mug! Celery--keep it fresh for two weeks! Ped Egg...the best pedicure ever! No more scrubbing pots and pans! Welcome to The Helpful Home! I started this blog to share recipes, organizational tips, great finds, and helpful hints for busy parents and people struggling to just make it through each day. I'm a self-proclaimed "shop-a-holic," and love finding new "great finds" or new uses for existing beloved items. Though I'm becoming a "foodie," I'm far from being a good cook. Over the past three years, I have found easy and delicious recipes, tips for cooking--and it has improved my culinary skills immensely! I'm continually on the look-out for recipes that are quick & easy, tasty, and will make your friends and family believe you worked harder than you did! I also believe in finding tips & hints to make our home life simpler, to free up time to spend with those we love. I hope you all find something useful on thehelpfulhome.com, share your comments, and come back often! Aloha!